It was through the quest of Digger Te Kanawa and myself to find a way to celebrate the entrance way to Hamilton Gardens that the sculpture Nga Uri o Hinetuparimaunga was born. The eroded forms of the ignimbrite escarpment at Hinuera gave inspiration for the 21 columns. It was appropriate to use this stone too because I'm told the erosion of this material over thousands of years has formed much of the land of the Waikato region, carried and deposited by the Waikato river. The land of Hamilton Gardens is beside the river. The stone is symbolic of this earth. The need to symbolically protect five of the hinuera columns with an earth blanket or Kākahu, a protective woven pebble cloak, came to me from witnessing too much local, national and international disrespect for mother earth. Along with protection, the Kākahu also symbolically honours the wonder of mother earth. 12,000 quartz pebbles from Southland and 1000 greywacke pebbles from Kaiaua form the Kākahu which is titled, Te Kahu o Papatuanuku. Three ancient symbols were translated into stone from a celebrated Korowai woven in thread by Digger Te Kanawa. they are: Nihoniho, Poutama and Toorakaraka. The title for the complete sculpture, Nga Uri o Hinetuparimaunga, was given at the official handover ceremony on 5th April 2005 by Haare Puke and John Haunui, Kaumātua of Ngati Wairere. 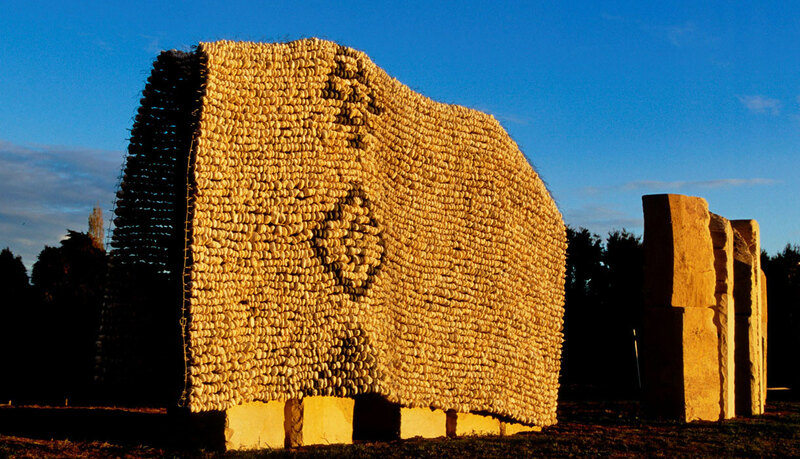 The Kakahu was titled Te Kahu o Papatuanuku, on 3rd April, 2005 by Ngati Wairere Kaumātua, Haare Puke, Maniapoto Kaumatua, Buddy Te Whare and Maniapoto Kuia, weaver, Digger Te Kanawa.